The Hudson Theatre first opened on October 19, 1903, with Cousin Kate starring Ethel Barrymore. Although the architectural design of the theatre was first drawn up by the firm of J. B. McElfatrick & Son in 1902, the project was taken over and completed by the firm of Israels & Harder. It was built for theatrical producer Henry B. Harris, who managed the theatre until his untimely death as a passenger on the RMS Titanic in 1912. His wife took on managerial duties after that date. During the 1930s and 1940s, the building was also used as for CBS Radio broadcasts, when it wasn't being used for theatrical productions. NBC purchased the property in 1950, converting it into a permanent television studio and it would later become the home of "The Tonight Show" from 1954 to 1959. Over the next few decades, under the ownership of developer Abraham Hirschfeld, the theatre was used for a number of different purposes: as a legitimate theatre (1960 to 1968), an adult movie house (from 1974), and as the Savoy rock club (from 1980). 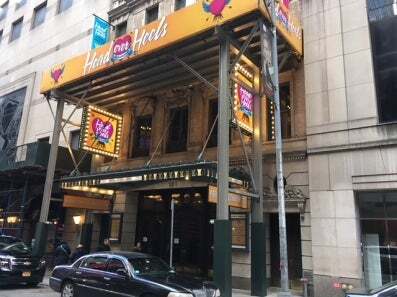 The theatre was purchased by Millennium & Copthorne Hotels in 1995 as a part of the surrounding luxury hotel known as the Millennium Broadway and used as a business conference center and auditorium. During this time, it was additionally used as a stand-up comedy venue for Comedy Central broadcasts. In 2015, it was announced that the Ambassador Theatre Group would purchase the venue as its second official Broadway venue (the Lyric being its first) and the Hudson was re-opened in 2017 with a revival of Stephen Sondheim's musical Sunday in the Park with George, starring Jake Gyllenhaal. The Hudson Theatre was awarded New York landmark status in 1987.